The True Focus II autofocus system offers accurate auto-focusing when recomposing images and Immediate Focus Confirm (IFC) means there is no need to stop shooting to check if your shot was in focus. The DAC Automated Lens Correction System relays information about capture conditions and the specific lenses being used to tweak autofocus and metering for improved imaging results. Images are produced in the Hasselblad 3FR lossless compressed RAW files and 1/4 resolution print-ready JPEG files. Customized settings profiles for aperture, shutter speed, AF-mode are available with the touch of one button and can be transferred to other H5D cameras. An updated Graphical User Interface makes navigation easier and the 3.0" TFT LCD Display offers clear image playback. The bright HVD-90x Eye-level Viewfinder with 3.1x image magnification and diopter adjustment is packaged with the H5D-40, but other viewfinders are available including the HVM Waist-level viewfinder. Physically, the camera has a high-strength aluminum inner core and stainless steel housings for lightweight durability that is comfortable for hand-held photography. Large, ergonomic buttons and improved weather sealing are part of the H5D-40's new design. The H5D-40 is fully compatible with the HC/HCD line of central lens shutter lenses. As mentioned, these lenses integrate DAC and True Focus II technology for clear and accurate image capture. They allow flash sync at all shutter speeds, enabling the use of flash in all lighting conditions. With the optional CF adapter, all central lens shutter V system Carl Zeiss lenses can also be used. The H5D-40 also features a Digital Spirit Level function to assist in accurately placing the camera in a vertical or horizontal position. The camera comes with both Phocus, the Hasselblad proprietary image processing software, and Adobe Lightroom. The H5D-40 camera allows information from the lens and exact capture conditions to be fed to the camera processor for ultra-fine tuning of the auto-focus mechanism, taking into account the design specifications of the lens and the optical specifications of the sensor. Digital Lens Correction (DAC) is an automatic correction of the images based on a combination of the various parameters concerning each specific lens for each specific shot. Hasselblad H System lens line (12 lenses from 24 to 300 mm) with integral central lens shutter system is fully compatible with the H5D-40. And all central lens shutter V system Carl Zeiss lenses are compatible via the optional CF adapter. 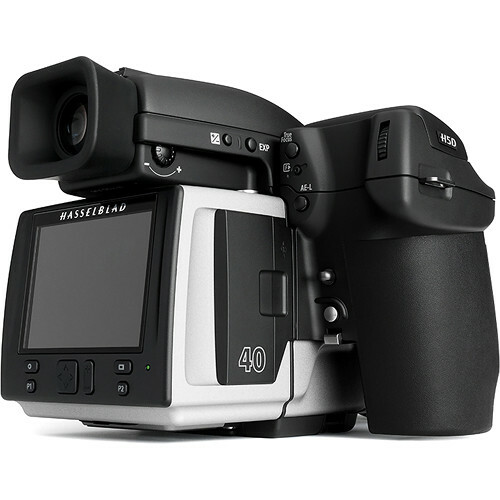 The H5D-40 can save up to seven customized complete camera settings profiles. Custom profiles can be passed to other H5D cameras. The H5D-40 has a 3.0" TFT type LCD display with 24-bit color and 460,320 pixels and larger, easier to read display style. Supported in Phocus by Hasselblad and Hasselblad Tethered plug-in for Adobe Photoshop Lightroom, tethered operation is possible in the field or studio. The H5D-40 offers a choice of storage devices: CF cards or a computer hard drive. With these operating and storage options, you are able to select a mode to suit the nature and location of your work. The H5D has been physically redesigned to be more ergonomically friendly and durable. More programmable buttons and larger, more reachable buttons improve performance and workflow and improved weather sealing allows you to shoot in the field with less worry for your camera. The H5D comes bundled with both Hasselblad's proprietary image processing software, Phocus, and Adobe Lightroom 5. Both systems have been integrated to work with the H5D. You can operate your Hasselblad camera tethered to Lightroom with a plug-in and the Hasselblad natural Color System and digital lens correction profiles have been ported into Lightroom. can a pocketwizard transceiver for Nikon works for this camera? also, may I know what L-bracket we can use for this camera? Nikon Pocketwizard products are not compatible with Hasselblad cameras. There are currently no L brackets available for the H5D-40. Will this work with CamRanger? Unfortunately, the CamRanger only supports select Canon and Nikon cameras. Will the standard 80mm f/2.8 HC lens on my H2F be fully compatible and fully operational with the H5D-40? I think so. Is the same lens model all Hasselblad H cameras use. Same H camera mount.